AV J.H.S. 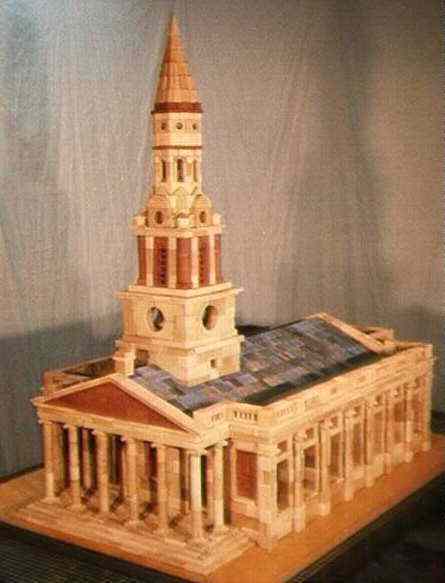 Jones, Troutbeck, Windermere, UK, created this reproduction of London's St. Martin-in-the-Fields. This neo-classical church was designed by James Gibbs in 1722-1724. I built it for the photographs. It was featured on this web site in March, 1997. AV Jones drew up, by hand, detailed plans of many of his buildings. AV Paul Neuman (not the actor) bought these drawings in the UK. He generously loaned the plans to me so I could build them. You will find more pictures on the builder's page. AV Brian Martinson bought all of the Jones designs in an auction of AV Paul Neuman's Anker collection. Brian is donating these plans to the CVA Archive. A very generous donation! Hence, my decision to reprise them for this web page. See Eigene Entwürfe in the CVA Archive. for the plans for this church and many more (but only about 20%) of AV Jones' Anker designs. The New Stone Era (Die neue Steinzeit) boxes are available in the USA! At the Treffen (meeting/open house) at the Anker factory in Rudolstadt, Germany, it was clear that the kids loved these new Anker stones. I was particularly impressed with the popularity of "X-Men". They came up with the most fantastic structures -- all free style. The GoKi partners, the owners of the Anker factory, know children's toys and what appeals to children. They had tried X-man in wood, but wood broke and was not stable enough. Anker stone X-men are solid and not easily broken. A link to the USA wholesale agent for The New Stone Era (Die neue Steinzeit) has been added to the list of links at the bottom of this page. And, of course, The New Stone Era (Die Neue Steinzeit) sets are now available in the USA, including here on-line. New sets are being introduced rapidly. These sets are intended for young children, not the older children and adults who enjoy the traditional Anker sets. The New Stone Era sets are very important because they introduce Anker to a new generation. And the Starter Set provides a transition to the traditional Anker sets. They are a perfect gift to children and grandchildren -- introducing them to the enjoyable hobby of building with Anker sets. If my eldest granddaughter is typical, a perfect first gift is the small dinosaur (DINOSA) set. Young children are fascinated by dinosaurs! I have been able to return to Microsoft's FrontPage. It seems that Win 8.1 supports this program, despite their claim that it doesn't. The last CVA meeting was held on Saturday, October 18, 2014; Hotel Lapershoek in Hilversum, Netherlands. The next CVA meeting: Saturday, April 11, 2015. AVs in Berlin will hold a Treffen at the Gotisches Haus, D-13597 Berlin Spandau, Breitestr. 32. The date is Saturday, March 28, 2015, which is two weeks before the CVA meeting in Hilversum. The Austria Anker/Matador friends plan to meet at the Stadtmuseum Traiskirchen on Saturday, July 11, 2015. An Anker Treffen was held in Rudolstadt on Saturday, September 6, 2014, at the Anker factory in Rudolstadt, Germany. An additional get-together at Hodes, Mörla, on Friday. Only two non-Germans attended. The date was too early. The next Anker Treffen in Rudolstadt will be on Saturday, September 19, 2015. Most -- #s 6 through 30A and the NS conversion set -- are in stock! Aeropharm is a division of Hexal. All of Hexal was acquired by Sandoz (which is part of Novartis). The production facility in Rudolstadt is quite large. Anker friends note the direct connection between this factory and Richer's Anker Works (Ankerwerke). Aeropharm and the factories in Schwarza are the largest employers in Rudolstadt area. In addition, every year, the new Anker factory in Rudolstadt, Germany holds three or four "Treffen", or "open door days", at that factory. The Treffen in September attracts many Anker friends. The Treffen in 2015 will celebrate the 20th anniversary of the new factory's first Anker sets. The Club of Anker Friends (CVA) has published a Stone Catalog. A printing was done; these catalogs were sent to CVA members. There are a few CVA Stone Catalogs left for sale!!! Just ask for one! But none are in the USA. Revisions are being made as needed. Not major omissions, but changes are worth making. This catalog is now available all, not just CVA members. For the month of March & April, 2015. "Anker" and "Anchor" (in the USA) are registered trademarks of the Anker Steinbaukasten GmbH.